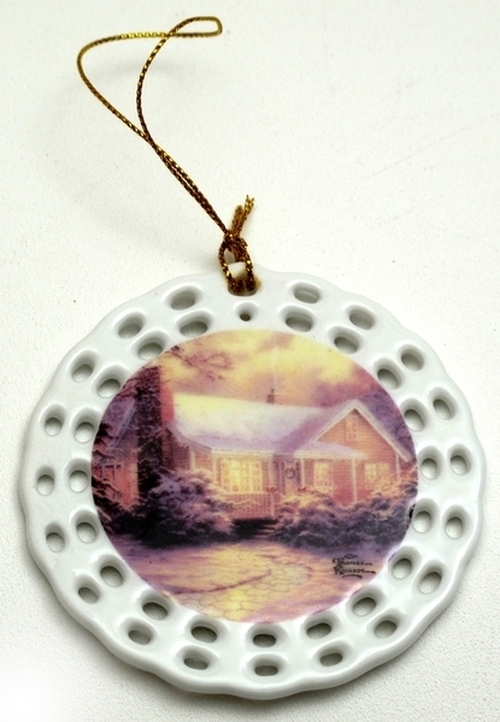 Thomas Kinkade 'Christmas Cottage' Ornament REDUCED! Thomas Kinkade Christmas Cottage Ornament - Celebrate the movie with this genuine Thomas Kinkade porcelain ornament! The movie Thomas Kinkade's Home for Christmas is inspired by the early life of Thomas Kinkade, the story of how a small community and an aging mentor come to the aid of a family to same the only home they have ever known; and along the way teach a young man the meaning of love, friendship, and what it means to be an artist. Measures 3" diameter. Color gift boxed. The Painter of Light is regarded as the most collected living artists of all time, and the works of Thomas Kinkade are displayed in millions of homes, in many forms. A native of California, Kinkade demonstrated his talent at an early age and went on to become an award-winning painter - using techniques of the Impressionists to achieve his unique effects.